Stormshield is a family run company which aims to provide excellent window & conservatory solutions for those in the Newcastle area. This article aims to discuss the benefits of an orangery and the options that you have available. Orangeries can add extra character to a home and have many benefits. If you would like a quote for an Orangery Newcastle then please call us today 01670 710050. One of our friendly team will be able to advise you on the different types of products and services we have! An orangery is a structure that can be added to a house, adding light and space. It is similar to a conservatory but more substantial, with brick pillars and a range of different roofing materials, unlike a conservatory which is made of glass. When trying to determine whether a structure is a conservatory or an orangery, people can use the 75 percent rule which states that if the building is more than 75 percent glass, it is a conservatory, any less and it is as an orangery. While most conservatories have glass roofs, orangeries have a solid roof, with roof lanterns letting in light. Orangeries have been used in properties for centuries, dating as far back as the 14th century, although they did not become popular until around the 17th century. Their original purpose was to shelter fruit trees from harsh weather. They were commonly found on the fashionable residences of people in high society, who wished to grow oranges and other citrus fruit and exotic plants. When international shipping resulted in a cheaper and easier way to get hold of such exotic foods, orangeries were transformed into extensions of living areas and have remained so to this day, thankfully no longer exclusive to the rich and elite. Some famous orangeries in the UK include Kensington Palace, Kew Gardens and Powis Castle. Suitable for a range of purposes, such as a study, sitting area, dining room, playroom or workout space, an orangery can be a standalone room or an extension of another room, such as the kitchen or sitting room. An orangery can be a delightful addition to a home, blending in seamlessly with the home’s existing design. If you are interested instead in getting a conservatory in Newcastle, visit our Conservatory Newcastle page for more information. Unlike conservatories, orangeries are more complex in the sense that they can be used for a range of different types of rooms and designs. Of course, this will depend on the general look and feel of the orangery you decide to go with, however, this is in your hands! You can choose from a range of styles and colours to suit your needs. Common uses for orangeries include dining areas, playrooms and even less common uses such as lounges and gyms. Before you decide to purchase an orangery, make sure you are set on its purpose so that we can tailor your product to this. Orangeries are built onto your home using bricks and therefore act more as an extension than anything else. As stated before, orangeries can be used for any type of room and therefore act as extra living space for the home. 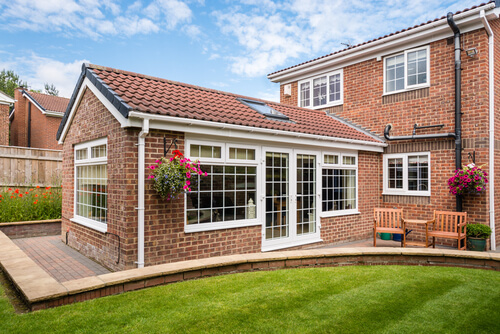 Due to the flexibility that orangeries offer, you can choose colours and brick styles to suit the look of the rest of your home that is already there. Once it is finished, it will look like it was already part of the home. This can’t be a bad thing! An orangery, like any sort of house extension, adds a new life and extra space to the house it has been built on. Most people choose to purchase an orangery when looking to expand their home. Perhaps if your family has grown bigger in the past few years or you just want more space for the kids to play in, there are so many different reasons for wanting to purchase an orangery. A larger living space can encourage a more productive and social home. An orangery can provide economic value in two different ways. Firstly, they provide extra insulation to the home. This means that you will save money on your energy bills as the heat from the insulation will stop you from putting on the heating so often. Secondly, they add value to your home, if you ever decide to sell in the future. The orangery can also be a great selling point for new buyers. An Edwardian style orangery incorporates a rectangular or square shape, with a faceted, ridged roof, reminiscent of the Edwardian era of architecture. Victorian style orangeries use gothic features to add to the Victorian feel of the building. They are rounded in shape, with a bay window. A Lean-to orangery has a roof that slopes against one side of the property, hence the name ‘lean to’. Gable front orangeries offer large amounts of floor space and a high pitch roof, maximising light flow to the property. You can choose to opt for a Skypod orangery, to bring more light into your home and increase the bright, airy feel an orangery can give. Skypod is an innovative, practical and stylish solution, ideal for orangeries. A Skypod roof helps to increase natural light and is available in a range of colours and glazing styles to blend in with the style of your home. It is also extremely energy efficient, saving you money on heating bills throughout the winter. For more information on a Skypod for your orangery, contact one of our team who can advise you. We fit all our orangery doors with Yale locks as standard. Yale is the world’s leading lock brand and all Yale products are accredited with ‘Secured by Design’. We even offer keyless locking and unlocking thanks to Yale’s Keyfree security lock technology. In addition, all our windows are fitted with multi-point locking systems as standard, so you can trust that your orangery will be safe and secure at all times. Orangeries incorporate a fusion of different building materials such as brick pillars and solid roof technology to create a beautiful and homely space which can, in theory, be used for anything you wish. It is an integrated and permanent structure of a home. Along with the amazing orangeries, all of our door and window installations come with the most innovative locking systems to ensure that your home is protected 24 hours a day, 7 days a week. We ensure that only the highest quality materials are used in the creation and installation of any job. We even supply the highly popular Guardian Roof. 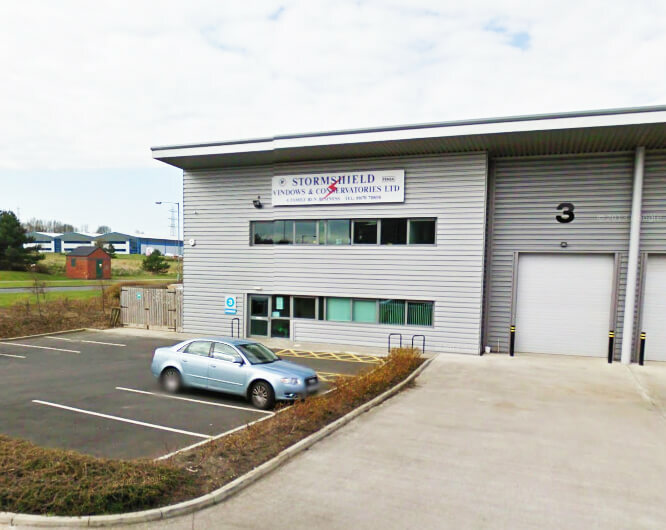 Visit our showroom to see more of our products, including our stunning orangeries and to get advice from our friendly staff. Like what you’ve read? Stormshield is waiting to transform your home with an Orangery Newcastle. Get in touch with the team today for a quote! We have years of experience in the industry and would love to use this experience in a job for you. Call us today on 01670 710050 or email us.